In: Andreas Holzinger, Alan Pope, Hugo Plácido Silva (Hrsg.). Physiological Computing Systems. Springer 2019. In: Proceedings in the 9th International IEEE EMBS Conference On Neural Engineering (NER’19). International IEEE/EMBS Conference on Neural Engineering (NER-2019) March 20-23 San Francisco CA United States IEEE Xplore 2019. In: S. Oviatt, B. Schuller, P. Cohen, D. Sonntag, G. Potamianos, A. Krueger (Hrsg.). The Handbook of Multimodal-Multisensor Interfaces. 3 Morgan & Claypool Publishers San Rafael, CA 2019. In: International Conference on Robotics and Automation. IEEE International Conference on Robotics and Automation (ICRA-2019) May 20-24 Montréal Québec Canada IEEE 2019. In: Applied Intelligence 2019 Springer International Publishing International Publishing 2019. In: Meyer-Aurich (Hrsg.). Digitalisierung in kleinstrukturierten Regionen. 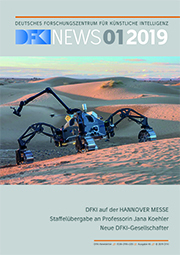 Gesellschaft für Informatik in der Land-, Forst- und Ernährungswirtschaft (GIL-2019) Digitalisierung in kleinstrukturierten Regionen February 18-19 Wien Austria LNI Gesellschaft für Informatik 2019. In: Proceedings of the IFAC Symposium on Intelligent Autonomous Vehicles. IFAC Symposium on Intelligent Autonomous Vehicles (IAV-2019) July 3-5 Gdansk Poland IFAC 2019. In: Robotics and Autonomous Systems (RAS) 110 Seiten 12-32 Elsevier 12/2018. In: Sung-Phil Kim (Hrsg.). Frontiers in Neurorobotics 12 Frontiers 12/2018.